Previously thought to have been scrapped, happily this is not the case as you can see! 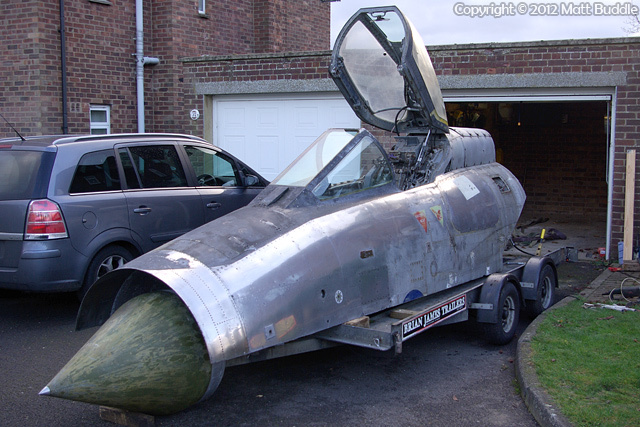 The nose from ZF590 was removed from the rest of the airframe some years ago (see separate entry for the fuselage) and she was then further reduced in size for filming (acting as a 'Reaper' spaceship cockpit in the Wing Commander film). Once filming was finished she ended up in storage for a time before ending up on display as one of various sci-fi film props at a tourist attraction in Scotland before moving on to a paintball park. Matt rescued her from that fate; the various additions to her exterior to turn her into a Reaper ended up protecting the real exterior panels quite well, and she's seen here after some hard work polishing the panels. The cockpit interior is quite bare but Matt's working on restoring it.